If you are an iTunes user, you won't be unfamiliar with .m4v format. What is M4V? It's a video file format developed by Apple to encode TV episodes, movies and music videos in iTunes Store. From the comparison of M4V and MP4, M4V is quite similar to MP4 format except that M4V format always comes with Apple's FairPlay DRM copy protection for anti-piracy purpose. Briefly, if you want to play DRM-protected M4V files, you need to be authorized with iTunes account on Mac iPhone iPad iPod. Are you at your wit's end to play M4V on non-Apple devices? Not really. M4V files can also be played on non-Apple devices like MP4 does only if there is a M4V converter for Mac. Why Do You Need to Convert M4V to MP4? iTunes M4V is only supported by a certain type of Apple products, namely iPhone, iPad, iPod, Apple TV, excluding any Android/Windows mobile devices. You are advised to watch the purchased or rented M4V files within 24 hours, or else it will be deleted beyond the schedule time. Only 30 days are available for iTunes rental M4V movies. Only if you remove the M4V DRM, can you keep the purchased or rental iTunes movies without expiration worrys and watch them limitlessly like what you watch MP4 files on Android, Windows, Microsoft devices as you like. MacX Video Converter Pro is precisely an excellent M4V converter for Mac to remove iTunes DRM from M4V. On one hand, it's a M4V to MP4 converter Mac which enables you to convert M4V to MP4, MOV, AVI, MKV, WMV etc. for playback not only on iPhone iPad but also Android tablets/phones, Windows tablets, PSP, Kindle Fire, etc. On the other hand, this M4V DVD ripping software can be a screen recorder too, allowing you to record your iTunes M4V files flawlessly to MP4 MOV etc. like Convert to MP4, MOV, AVI, MKV, MP3, iPhone Ringtone, etc. Directly convert video to all the latest iOS iPhone Android device. 1:1 record the on-screen activity, tutorial, non-downloadable M4V video. Well, this Mac M4V converter provides you two superb ways to remove iTunes DRM from M4V. No matter which one you choose, free download this M4V converter for Mac (or Windows version for PC) and make sense of the rather simple steps of converting can be the top things. Here we go! Step 1:	Load M4V videos to the program. Run this M4V to MP4 converter on Mac and import your .m4v format files by clicking "+" button or directly dragging and dropping them to the main window of this program. Step 2: Choose MP4 as the output file format. Choose MP4 as the output format from the automatically popped-up window. As you can see, there are also piles of other formats for your choice. Or you can even pick up the target devices from 420+ preset profiles to play the converted M4V files. Hit "RUN" button to start converting iTunes movies to MP4 and finally Unlock protection from iTunes M4V. Step 1: Enter screen recorder interface. 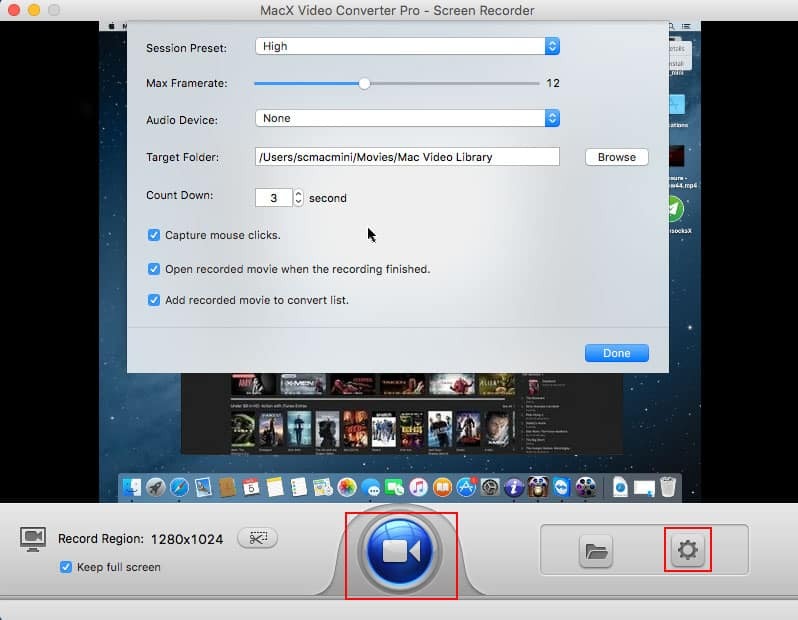 Run this Mac M4V DRM converter and click "Screen Recorder" button to enter the screen recorder interface. Click the gear shaped button and you are allowed to customize the capture area, add sound effect to your video, adjust video frame rate, select a target folder as output location, etc. Hit "Record" button, the program will start capturing activity on your screen within a few seconds. Once the recording finished, the DRM will be automatically removed from the iTunes. The screen recorded video is formatted in MOV by default. 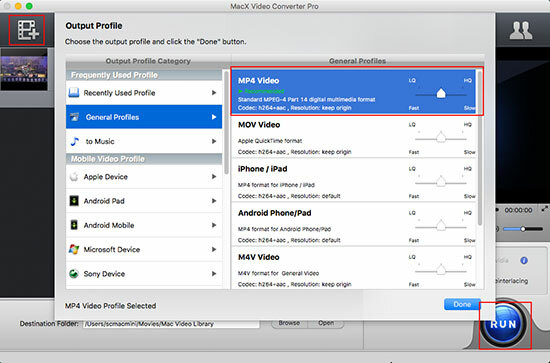 If you want to play the recorded M4V video on other non-Apple gadget, you can check the box of "Add recorded movie to convert list" and convert video to MP4/FLV/AVI etc formats so as to play iTunes M4V movies on TV, but also iPhone Android needless of additional M4V codec. If you wanna convert iTunes M4V to DRM-free MP4 for watching on your iPhone iPad iPod touch, there is an easier M4V to MP4 converter for Mac - MacX MediaTrans, allowing you to convert M4V to MP4 and transfer it to iOS devices at a stroke. It delivers super easy steps for M4V conversion and transferring. Before everything, you need to free download MacX MediaTrans first. Then let's start. Step 1. Launch the app and plug in your iPhone to Mac Computer with a USB cable. Step 2. Click on Video, and choose the target iTunes M4V videos. You can also tick on the box of Select All to choose all your iTunes M4V videos. Step 3. Press Export to transfer and convert iTunes DRM-ed M4V to MP4. Note: Some of the DRM-protected M4V files may make you get involved in copyright issues. Make sure to get the converted M4V files for fair use in Academic and Research. BTW, the software developer does not encourage any illegal reproduction or distribution of copyrighted content.